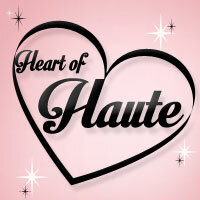 It's time once again for another Heart of Haute review! HOH is one of my top 2 favourite clothing companies design and run by one of the sweetest girls in the world and I absolutely adore what they produce. As we enter the tail end of winter here in Melbourne it's time to start planning my spring wardrobe and with Heart of Haute I've got that covered. 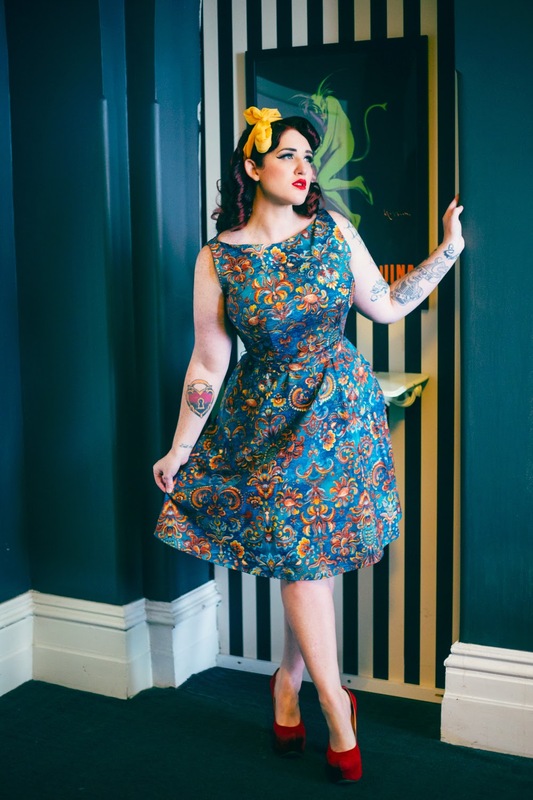 These image were shot at the Albany Hotel with the amazing Jem Shoots Frames behind the lens. 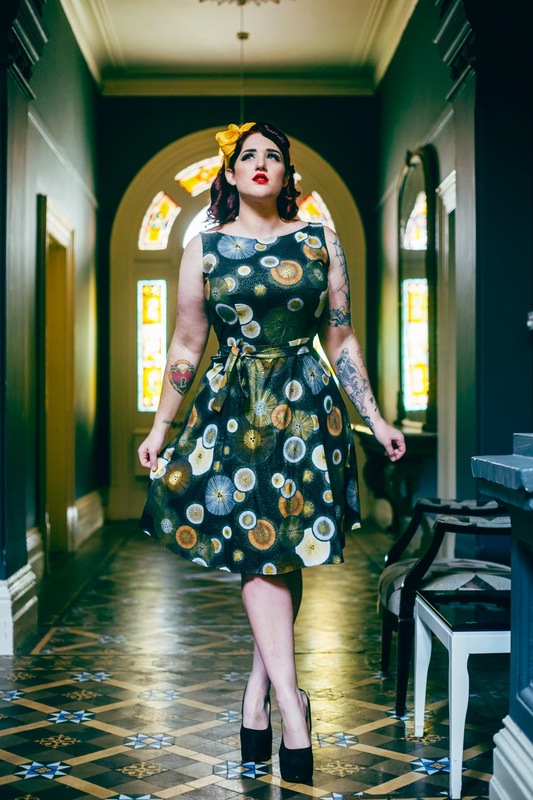 The Mallory dress as peaked my interests for a while now but I wasn't to sure how it would look on my body. Well that was time wasted not wearing this wonderful frock as it's absolutely perfect for it! From the deep v neckline to the cinched in waist this dress does amazing things for my figure. It emphases my my waist and hourglass curves while hiding my problem areas such as upper arms. 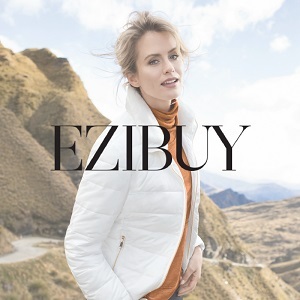 The roomy sleeve allows for anyone with a bigger arm to easily slip into the garment and the non fitted aspect is great for summer as you'll not have too much fabric clinging to your skin. As with all HOH garments I'm wearing each item in this review in a size XL. The fit on this dress is absolutely perfect and the ties in the back give you the ability to tighten the waist to what ever suits you best. Now that I'm completely sold on this dress style I hope to see more prints in the future. 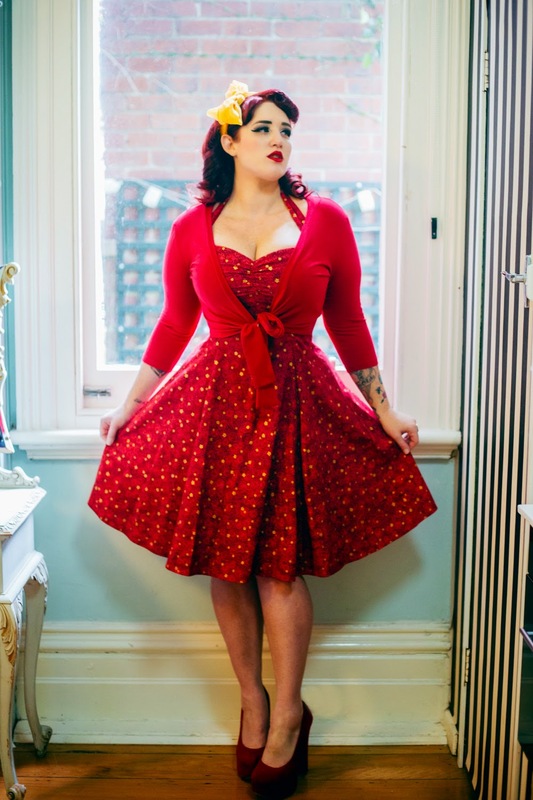 I tried on my first Sweetie Dress at a paid shoot a year and a half ago and was amazed on the fit and feel of the garment. I'm usually not one for halter neck dresses but the XL fit so wonderfully on my bust so I've been looking to buy one ever since. I had my eye on the gingham for a while but as soon as the previews for the Kimmie print popped up on facebook I knew that would be my first Sweetie. This dress screams summer and I can't wait to style it over the warmer months. 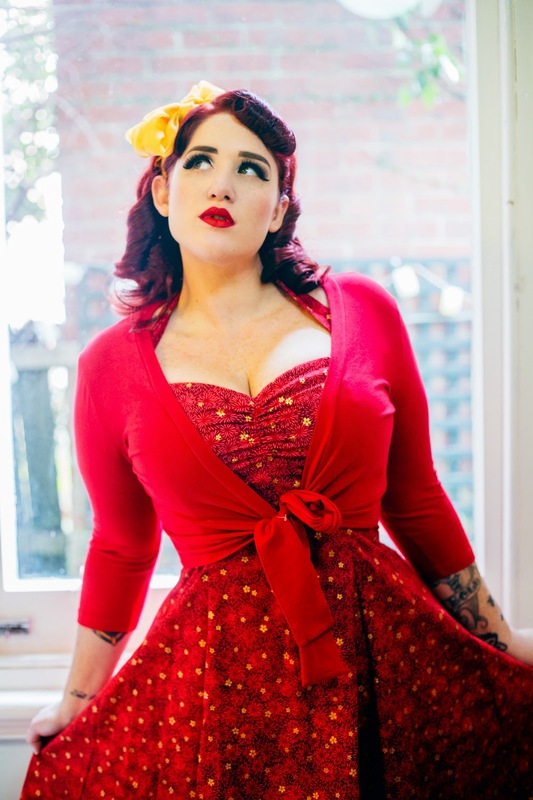 From dressing up or down there is so much you can do with this red hot frock! I paired this dress with the Sweet Sweater in red as they were born to be worn together. The sweater hides any problem areas and also hid my bra as I was silly enough for forget a strapless for this shoot! I absolutely adore the shapes these two create together and can't wait to add another few versions of the dress to my collection. Ok it has to be said! 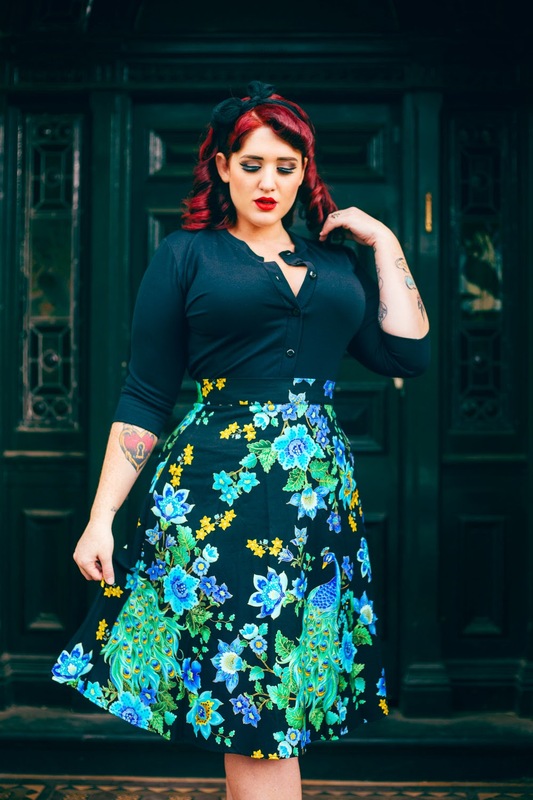 Not only is Many the Queen of Retro frocks but she makes the most amazing separates that get you through every season and every occasion. The appropriately names Perfect cardigan is a wonderful piece that ever girl needs in her collection. Worn here in basic black it pairs perfectly with the bright and bold Peacock print skirt. I own another version of this cardigan from a few years back in argyle and it is something I'll never part with. It's a figure hugging knit that looks great with anything - jeans, skirts dresses and shorts. The Aline skirt in Peacock Royal is absolutely stunning. From afar you think it's just a beautiful floral print but as soon as you see that glorious peacock your heart will melt. The waist on this skirt is a perfect fit and the length as you can set just hits bellow my knees. 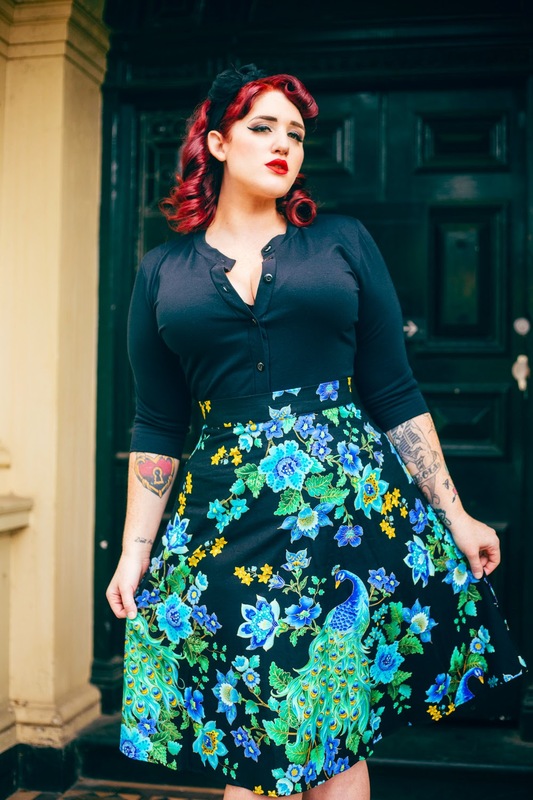 You can also find this print other style skirts and dresses and a new colour way named Midnight Peacock has recently been added. Click here to find all of the peacock prints Heart of Haute have to offer. Please excuse me while I just up and down with excitement due to adding another Ella Top to my collection. This is my 3rd Ella top and I'll only stop ordering these babies when they stop making them. 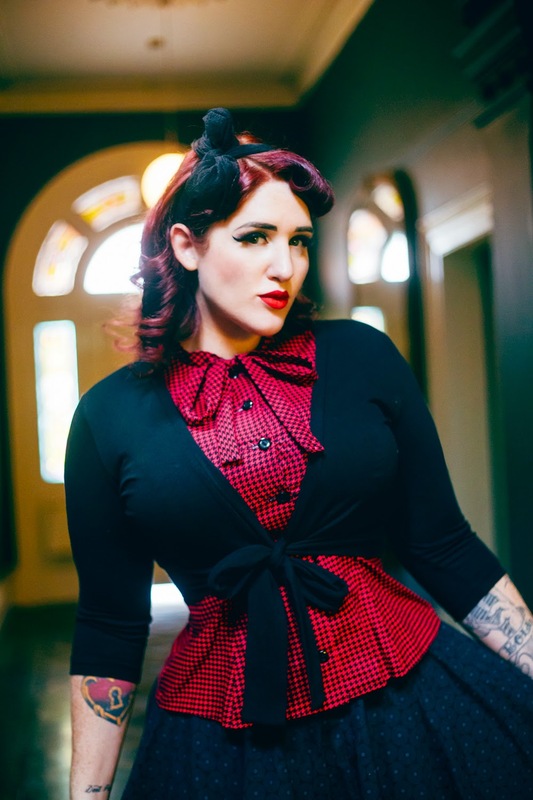 The Ella is a sleeveless button up top that works perfectly for my large bust! The black version of the Sweet Sweater has also been paired with this top as I think it works wonderfully! I wear these sweaters constantly and love how they work with both tops and dresses. I've got my eye on the leopard and the polka-dot versions now! Paired with the MB Circle skirt which is a shorter length circle skirt in a funky spin out print. 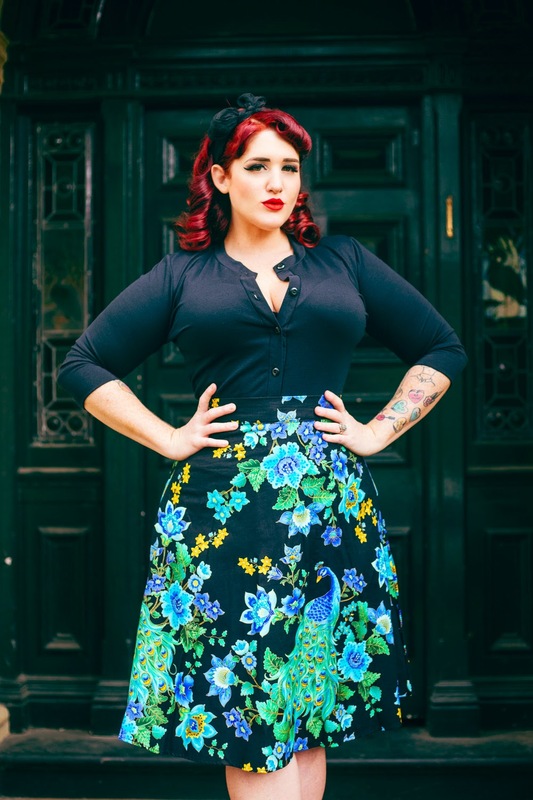 I have heaps of circle skirts in my closet now but I adore the short styles on offer through the MB collection. They are a more youthful, fun option and give you a little more leg to show. While this print is out of stock for the moment you can pick up Blue Anchor, Scotty Dogs, Aqua Dot, Constellations (glows in the dark), Black Honeycomb Dimensions and Red Houndstooth. Now for the work friendly summer dress option of the Monique dress. It's a rare occasion when don't see my cleavage but I'm glad that companies like HOH have created garments that cover large bust lines without causing any pancaking or smooched breasts. 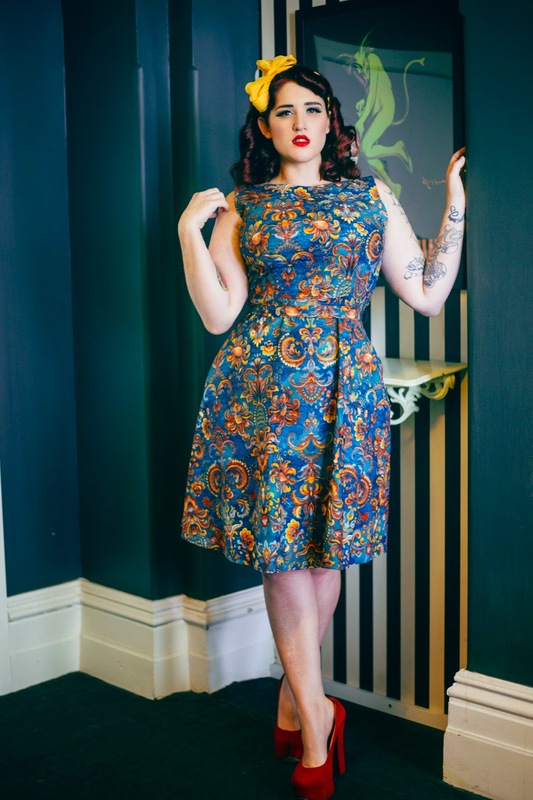 This is my second time modeling this dress style and when I slip into it I can honestly say it feels wonderfully and almost like it was made for my shape - shocking I know because it does not have sleeves! But I do feel great in the Monique and love what it does for my figure. The Odyssey print is also amazing and really stands out. It makes you feel like your wearing a fabric version of fireworks and I adore it. This print is also available in 2 more garments and if you don't think the gold and bronze tones will suit you then you can find a blue version of the print here. Then to end my rather long and image packed review another of the Monique but this time Teal Damask. 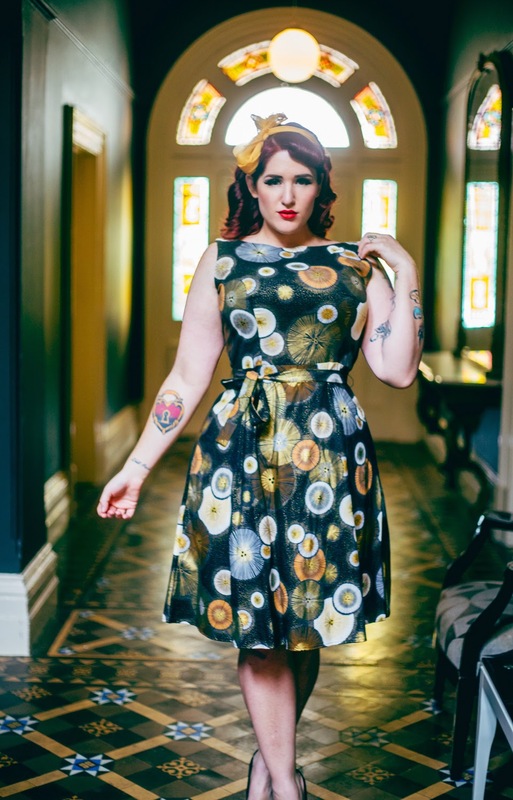 Sadly this print is sold out but I thought I'd shoot and include dress and it's stunning fabric either way. As I mentioned above the monique has am amazing fit and the little feature that helps for perfect fit is the waist tie. This nips you in at the smallest part of your waist adding that hour glass shape. For this dress I tied the bow at the back apposed to the front as shown in the previous Monique image and I love it just as much. So there you have it! My stand out favourites from the current season stock at Heart of Haute. Many thanks to my 'dressing team' for helping me in and out of these garments and to the absoutely wonderful Jemima of Jem Shoots Frames for setting up this great location and for working with me. I can't wait to head Sydney and catch up with you. Hello! Not to sound creepy but ... do you have a blog post about what you wear under the garments you're modeling? I ask not to be sketchy but I am well-endowed, as you appear to be also, but you're far more ... up ... than I can ever usually achieve. I'd love to hear more about how you accomplish that. Thanks! I've actually started wearing corsets under my garments when I model so that coupled with the bra makes for an amazing lift. I'm also writing about shapewear and it will be up over the weekend hopefully. I love, love, love your style and your posts. 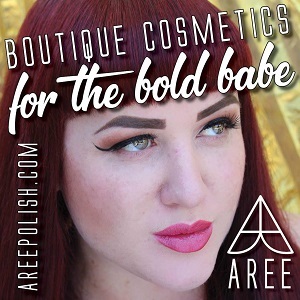 It always inspires me and it's helped introduce me to lots of new brands! 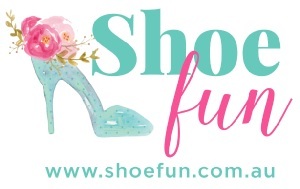 You've also inspired me to start writing reviews or blog entries about some of the products I'm particularly fond. Especially my shapewear, far too often I've found a lot of shapewear isn't made for actually curvy girls. Thank you for being so inspirational! PS - I've recently discovered the joy of wearing corsets *under* my clothes. Too many years in the Goth scene and I forgot that is what they were created for. Makes for a phenomenal silhouette under my wiggle dresses. What size are your monique dresses and the peacock skirt? Hi hun! A XL I wear all items from HOH in an XL so if it's not listed under the garment images check all of the other items sizes.